A stylish freestanding black Noble WC set would make an excellent addition to your modern bathroom. The noble black bathroom range is chracterised by the stylish minimalist design and clear lines. Manufactured from high-grade polyresin with chrome finished detailing. A 2 in 1 combination consisting of an open toilet brush holder made of plastic and a toilet paper holder. Supported by a heavy rectangular base plate for stability and support. At the cutting edge of contemporary design and superior build, the Noble freestanding WC set from Wenko is a stunning addition for any bathroom. It is finished in a polished chrome and the base is detailed with a minimalist style to add a touch of class. 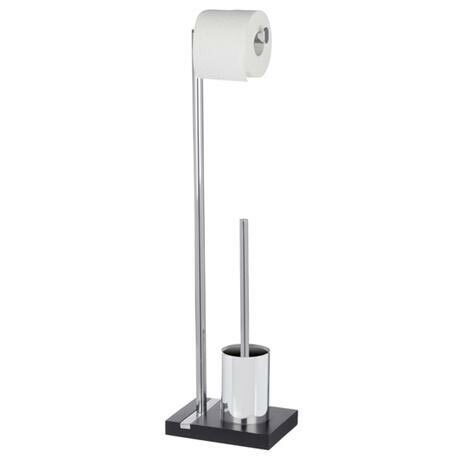 The ideal complement to any toilet with both a toilet roll holder and a toilet brush holder, it not only gives you everything you need in a WC set, but gives you a beautiful bathroom accessory.